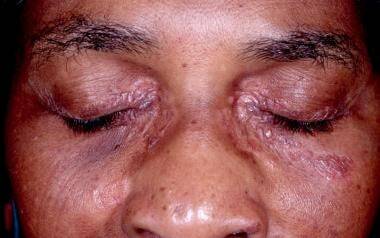 Dermatologic manifestations are seen in 25% of patients with sarcoidosis. They usually accompany systemic involvement, but in some cases they may be the only manifestations of the disease. Sarcoidosis is characterized by noncaseating epithelioid granulomas that may affect any organ system. Although Jonathan Hutchinson described the first case in 1869, the etiology of the disease is still unknown. The disease most commonly involves granuloma formation in the lungs, with 90-95% of patients having some pulmonary involvement. Other commonly involved organ systems include the lymph nodes (especially the intrathoracic nodes), the skin, the eyes, the liver, the heart, and the nervous, musculoskeletal, renal, and endocrine systems. Cutaneous involvement is classified as either "specific" or "nonspecific". Histopathologically, specific lesions manifest as noncaseating granulomas, whereas nonspecific lesions do not reveal granulomas on histopathologic examination. 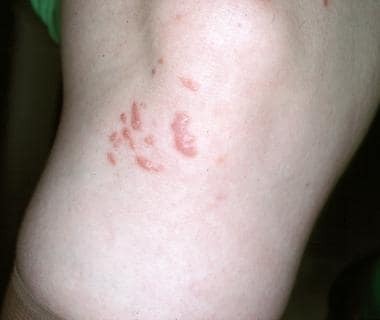 Erythema nodosum (EN) (shown below) is the main nonspecific cutaneous disease. 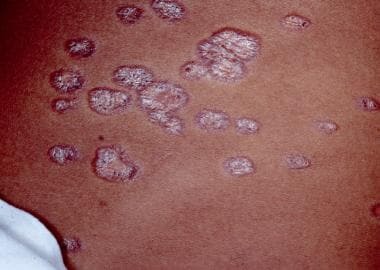 Lupus pernio, maculopapular, nodular, scar, plaque, angiolupoid, ichthyosiform, lichenoid, annular, verrucous, psoriasiform, and ulcerative lesions and subcutaneous nodules are examples of specific cutaneous disease. EN is a hypersensitivity reaction resulting from exposure to a variety of infectious agents (especially recent streptococcal infection), drugs (including oral contraceptives), or systemic inflammatory disorders (eg, sarcoidosis, inflammatory bowel disease). EN is usually an acute, self-limiting process and rarely requires treatment. Recurrences are uncommon. Tender, erythematous nodules are usually present on the extremities, most commonly on the anterior surface of the tibia. Fever, arthralgia, and malaise may occur. EN is more common in European, especially Scandinavian, women of childbearing age than in other people. Löfgren syndrome is classically described as a triad of EN, polyarthritis, and hilar adenopathy. The adenopathy may be unilateral or bilateral hilar and/or right paratracheal lymphadenopathy. Other symptoms include anterior uveitis, fever, ankle periarthritis, arthralgias, and pulmonary involvement. 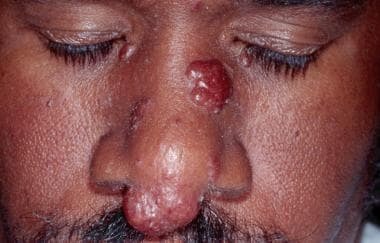 Lupus pernio with nodules on the nasal tip and sidewall. Cutaneous sarcoidosis. Violaceous papules or nodules of lupus pernio. Plaque sarcoidosis is characterized by round to oval, red-brown to purple, infiltrated plaques; the center of the plaque may be atrophic (see the image below). Some plaques may even appear scaly and can be confused with lesions of psoriasis or lichen planus. Dermoscopy may aid in the clinical diagnosis, as noted above. 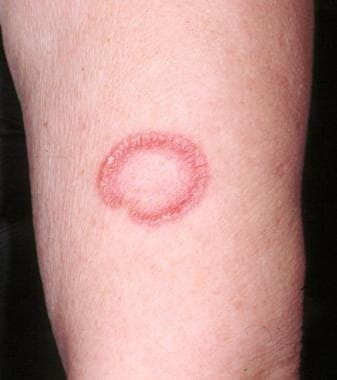 The lesions most commonly occur on the extremities, face, scalp, back, and buttocks, and they may have an annular appearance (see the image below). The distribution is usually symmetrical. Angiolupoid sarcoidosis is a subtype that has a similar appearance but has large, telangiectatic vessels in addition to the characteristics mentioned above. This form of cutaneous involvement is usually chronic; most patients have the disease for more than 2 years. Lesions can heal with scarring, and, if plaques involve the scalp, they may lead to alopecia. Patients with plaque lesions usually have more severe systemic involvement. Erythematous papules on the knee. 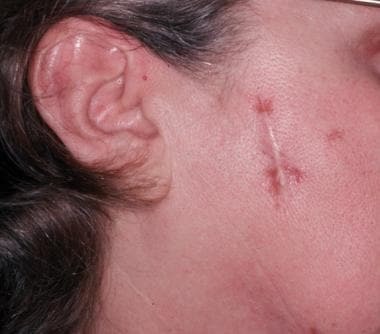 Infiltration of scars may occur (see the image below). Scars from previous trauma, surgery, venipuncture, or tattoo may become infiltrated and show a red or purple color. These lesions may be tender. Sarcoidosis with infiltration of a scar. The Kveim test is the most specific test for sarcoidosis. It is not commonly available, nor commonly used, because of difficulty in obtaining a validated antigen source, as well as a fear of transmitting infection. The Kveim test involves intradermal injection of tissue from the spleen or the lymph node of a patient with sarcoidosis. A biopsy sample is obtained from the area 4-6 weeks after injection and is histologically examined for noncaseating granuloma formation, which, if found, indicates a positive result. Regarding the tuberculin skin test, patients with sarcoidosis have impaired delayed-type immune reactions. Two thirds of patients with systemic sarcoidosis have cutaneous anergy to the tuberculin and other skin tests. It is not known if cutaneous anergy is frequent in patients with cutaneous lesions of sarcoidosis with little or no systemic involvement. The skin is the most easily accessible tissue for biopsy and is extremely helpful in supporting the diagnosis of sarcoidosis. Biopsy of erythema nodosum, however, is less helpful as it is not specific for sarcoidosis. 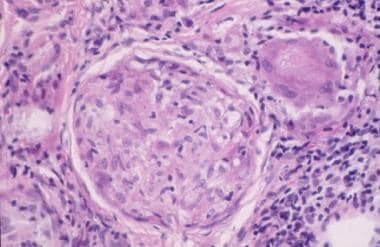 Biopsy specimens need to be sent for histologic examination, and staining may need to be performed to rule out infectious causes of granuloma formation, including mycobacterial and deep fungal infections. Tissue culture may be appropriate in some clinical settings, especially if fungal or atypical mycobacterial infections are suspected. Histopathologic features of sarcoidosis showing the hallmark noncaseating granulomas. Islands of epithelioid cells may contain a few Langhans giant cells. Giant cells may contain asteroid or Schaumann bodies. Asteroid bodies are star-shaped eosinophilic structures. Schaumann bodies are round or oval, laminated structures that are usually calcified at the periphery. The need for medical therapy varies based on the symptoms and the organ systems involved in each patient. Oral corticosteroids are usually the treatment of choice for patients with hypercalcemia and for those with serious end-organ involvement, such as symptomatic stage II and all stage III pulmonary disease, as well as for patients with neurologic, cardiac, or ocular involvement. As opposed to the more severe systemic involvement requiring oral therapy, Löfgren syndrome is usually an acute process that is self-limited and that resolves without immunosuppressive treatment in weeks. Symptomatic relief can be obtained using nonsteroidal anti-inflammatory drugs (NSAIDs) or relatively low doses of corticosteroids. Limited, nondisfiguring cutaneous involvement may be treated with topical or intralesional corticosteroids. Intralesional injections of 2-10 mg/mL  of triamcinolone acetonide can be used at monthly intervals. 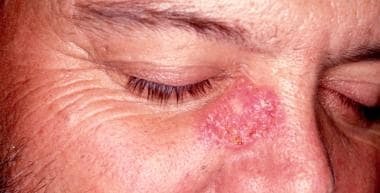 More chronic skin lesions, such as plaques or lupus pernio, require more aggressive therapy because they can lead to permanent scarring. Inpatient care is rarely needed for patients with cutaneous disease. However, in patients with respiratory insufficiency, hospitalization may be needed. Complications of systemic immunosuppressive therapy, namely severe infection, may result in hospitalization. Early involvement of other clinicians, such as an ophthalmologist, an internist, a rheumatologist, and a pulmonologist, for monitoring other organ systems that may be involved is recommended. Choice of consultation specialist is driven by symptoms and end-organ of involvement. Follow-up care should be frequent for the first 2 years after diagnosis. Patients with stage I disease can receive follow-up care twice yearly, whereas patients with more advanced lung disease should be seen more frequently. All patients should be monitored for at least 3 years after discontinuation of therapy. During follow-up care, patients should have a history with a review of systems and should undergo physical examination, chest radiography, and pulmonary function tests to evaluate for active or insidiously progressive disease. A baseline electrocardiogram is of use to assess for cardiac involvement and for future comparison if symptoms develop. Baseline laboratory examination may include calcium and vitamin D levels as calcium dysregulation with hypercalcemia may occur. In general, an angiotensin-converting enzyme (ACE) level has limited usefulness as a diagnostic test for sarcoidosis. Ophthalmologic assessment is needed initially—generally annually in all patients and more frequently in those with ocular involvement. Therapeutic use of hydroxychloroquine (Plaquenil) may also warrant more frequent, detailed ophthalmologic examinations. What is the prevalence of dermatologic manifestations of sarcoidosis and how are they characterized? How is cutaneous involvement in sarcoidosis classified? What is the manifestation of Löfgren syndrome in sarcoidosis? How is plaque sarcoidosis characterized? 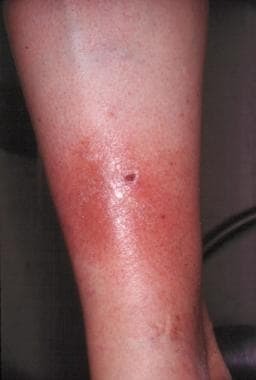 What is the manifestation of erythema nodosum (EN) in sarcoidosis? What is the manifestation of lupus pernio in sarcoidosis? What is the manifestation of macular sarcoidosis? How is subcutaneous nodular sarcoidosis characterized? Why is sarcoidosis called the great imitator? What is the association of sarcoid lesions with tattoos? Which dermatologic conditions should be included in the differential diagnoses of sarcoidosis? What is the role of the Kveim-siltzbach test in the diagnosis of sarcoidosis? What is the role of the tuberculin skin test in the diagnosis of sarcoidosis? What is the role of biopsy in the workup of sarcoidosis? Which histologic findings are characteristic of sarcoidosis? What is the role of pharmacologic therapy in the treatment of sarcoidosis? What is the role of nonpharmacologic therapy in the treatment of sarcoidosis? When is inpatient care indicated for the treatment of sarcoidosis? Which specialist consultations are needed for the treatment of sarcoidosis? What is included in long-term monitoring of patients with sarcoidosis? Caso F, Costa L, Rigante D, et al. Caveats and truths in genetic, clinical, autoimmune and autoinflammatory issues in Blau syndrome and early onset sarcoidosis. Autoimmun Rev. 2014 Aug 23. [Medline]. Caso F, Galozzi P, Costa L, Sfriso P, Cantarini L, Punzi L. Autoinflammatory granulomatous diseases: from Blau syndrome and early-onset sarcoidosis to NOD2-mediated disease and Crohn's disease. RMD Open. 2015. 1 (1):e000097. [Medline]. Hunt RD, Gonzalez ME, Robinson M, Meehan SA, Franks AG Jr. Ulcerative sarcoidosis. Dermatol Online J. 2012 Dec 15. 18(12):29. [Medline]. Pellicano R, Tiodorovic-Zivkovic D, Gourhant JY, Catricala C, Ferrara G, Caldarola G. Dermoscopy of cutaneous sarcoidosis. Dermatology. 2010 Aug. 221(1):51-4. [Medline]. Fancher W, Braniecki M, Guzman G, Groth J, Krunic A. Disseminated atrophic sarcoidosis with elastophagocytosis and elastic tissue loss. Br J Dermatol. 2014 Sep 16. [Medline]. Jorizzo JL, Koufman JA, Thompson JN, White WL, Shar GG, Schreiner DJ. Sarcoidosis of the upper respiratory tract in patients with nasal rim lesions: a pilot study. J Am Acad Dermatol. 1990 Mar. 22(3):439-43. [Medline]. Marcoval J, Maña J, Moreno A, Peyri J. Subcutaneous sarcoidosis--clinicopathological study of 10 cases. Br J Dermatol. 2005 Oct. 153(4):790-4. [Medline]. Ahmed I, Harshad SR. Subcutaneous sarcoidosis: is it a specific subset of cutaneous sarcoidosis frequently associated with systemic disease?. J Am Acad Dermatol. 2006 Jan. 54(1):55-60. [Medline]. Tchernev G. Cutaneous sarcoidosis: the "great imitator": etiopathogenesis, morphology, differential diagnosis, and clinical management. Am J Clin Dermatol. 2006. 7(6):375-82. [Medline]. Antonovich DD, Callen JP. Development of sarcoidosis in cosmetic tattoos. Arch Dermatol. 2005 Jul. 141(7):869-72. [Medline]. Garcia-Porrua C, Gonzalez-Gay MA, Garcia-Pais MJ, Blanco R. Cutaneous vasculitis: an unusual presentation of sarcoidosis in adulthood. Scand J Rheumatol. 1998. 27(1):80-2. [Medline]. Doherty CB, Rosen T. Evidence-based therapy for cutaneous sarcoidosis. Drugs. 2008. 68(10):1361-83. [Medline]. Gedalia A, Molina JF, Ellis GS Jr, Galen W, Moore C, Espinoza LR. Low-dose methotrexate therapy for childhood sarcoidosis. J Pediatr. 1997 Jan. 130(1):25-9. [Medline]. Lower EE, Baughman RP. Prolonged use of methotrexate for sarcoidosis. Arch Intern Med. 1995 Apr 24. 155(8):846-51. [Medline]. Webster GF, Razsi LK, Sanchez M, Shupack JL. Weekly low-dose methotrexate therapy for cutaneous sarcoidosis. J Am Acad Dermatol. 1991 Mar. 24(3):451-4. [Medline]. Jones E, Callen JP. Hydroxychloroquine is effective therapy for control of cutaneous sarcoidal granulomas. J Am Acad Dermatol. 1990 Sep. 23(3 Pt 1):487-9. [Medline]. Baughman RP, Lower EE. Steroid-sparing alternative treatments for sarcoidosis. Clin Chest Med. 1997 Dec. 18(4):853-64. [Medline]. Stagaki E, Mountford WK, Lackland DT, Judson MA. The treatment of lupus pernio: results of 116 treatment courses in 54 patients. Chest. 2009 Feb. 135(2):468-76. [Medline]. Pariser RJ, Paul J, Hirano S, Torosky C, Smith M. A double-blind, randomized, placebo-controlled trial of adalimumab in the treatment of cutaneous sarcoidosis. J Am Acad Dermatol. 2013 May. 68(5):765-73. [Medline]. Judson MA, Baughman RP, Costabel U, et al. Safety and efficacy of ustekinumab or golimumab in patients with chronic sarcoidosis. Eur Respir J. 2014 Jul 17. [Medline]. Heidelberger V, Ingen-Housz-Oro S, Marquet A, et al. Efficacy and Tolerance of Anti-Tumor Necrosis Factor α Agents in Cutaneous Sarcoidosis: A French Study of 46 Cases. JAMA Dermatol. 2017 Jul 1. 153 (7):681-685. [Medline]. Park SK, Hwang PH, Yun SK, Kim HU, Park J. Tumor Necrosis Factor Alpha Blocker-Induced Erythrodermic Sarcoidosis in with Juvenile Rheumatoid Arthritis: A Case Report and Review of the Literature. Ann Dermatol. 2017 Feb. 29 (1):74-78. [Medline]. Tu J, Chan J. Cutaneous sarcoidosis and infliximab: evidence for efficacy in refractory disease. Australas J Dermatol. 2013 May 8. [Medline]. Philips MA, Lynch J, Azmi FH. Ulcerative cutaneous sarcoidosis responding to adalimumab. J Am Acad Dermatol. 2005 Nov. 53(5):917. [Medline]. Kiorpelidou D, Gaitanis G, Zioga A, Bassukas ID. Short course of infliximab for disfiguring lupus pernio. Eur J Dermatol. 2008 Nov-Dec. 18(6):727-9. [Medline]. Kataria YP. Chlorambucil in sarcoidosis. Chest. 1980 Jul. 78(1):36-43. [Medline]. Waldinger TP, Ellis CN, Quint K, Voorhees JJ. Treatment of cutaneous sarcoidosis with isotretinoin. Arch Dermatol. 1983 Dec. 119(12):1003-5. [Medline]. Brechtel B, Haas N, Henz BM, Kolde G. Allopurinol: a therapeutic alternative for disseminated cutaneous sarcoidosis. Br J Dermatol. 1996 Aug. 135(2):307-9. [Medline]. Bachelez H, Senet P, Cadranel J, Kaoukhov A, Dubertret L. The use of tetracyclines for the treatment of sarcoidosis. Arch Dermatol. 2001 Jan. 137(1):69-73. [Medline]. Baughman RP, Judson MA, Lower EE, Drent M, Costabel U, Flavin S, et al. Infliximab for chronic cutaneous sarcoidosis: a subset analysis from a double-blind randomized clinical trial. Sarcoidosis Vasc Diffuse Lung Dis. 2016 Jan 15. 32 (4):289-95. [Medline]. Heffernan MP, Anadkat MJ. Recalcitrant cutaneous sarcoidosis responding to infliximab. Arch Dermatol. 2005 Jul. 141(7):910-1. [Medline]. Carlesimo M, Giustini S, Rossi A, Bonaccorsi P, Calvieri S. Treatment of cutaneous and pulmonary sarcoidosis with thalidomide. J Am Acad Dermatol. 1995 May. 32(5 Pt 2):866-9. [Medline]. Kalajian AH, Van Meter JR, Callen JP. Sarcoidal anemia and leukopenia treated with methotrexate and mycophenolate mofetil. Arch Dermatol. 2009 Aug. 145(8):905-9. [Medline]. Kouba DJ, Mimouni D, Rencic A, Nousari HC. Mycophenolate mofetil may serve as a steroid-sparing agent for sarcoidosis. Br J Dermatol. 2003 Jan. 148(1):147-8. [Medline]. Saylam Kurtipek G, Ataseven A, Kurtipek E, Kucukosmanoglu İ, Toksoz MR. Resolution of Cutaneous Sarcoidosis Following Topical Application of Ganoderma lucidum (Reishi Mushroom). Dermatol Ther (Heidelb). 2016 Mar. 6 (1):105-9. [Medline]. Lee JB, Koblenzer PS. Disfiguring cutaneous manifestation of sarcoidosis treated with thalidomide: a case report. J Am Acad Dermatol. 1998 Nov. 39(5 Pt 2):835-8. [Medline]. Rousseau L, Beylot-Barry M, Doutre MS, Beylot C. Cutaneous sarcoidosis successfully treated with low doses of thalidomide. Arch Dermatol. 1998 Aug. 134(8):1045-6. [Medline]. Gharavi N, Diehl J, Soriano T. Cutaneous Sarcoidosis Successfully Treated With Intralesional 5-Fluorouracil. Dermatol Surg. 2015 Sep. 41 (9):1082-5. [Medline]. Fazzi P. Pharmacotherapeutic management of pulmonary sarcoidosis. Am J Respir Med. 2003. 2(4):311-20. [Medline]. Kaura V, Kaura SH, Kaura CS. ACE Inhibitor in the treatment of cutaneous and lymphatic sarcoidosis. Am J Clin Dermatol. 2007. 8(3):183-6. [Medline]. Wilsmann-Theis D, Bieber T, Novak N. Photodynamic therapy as an alternative treatment for cutaneous sarcoidosis. Dermatology. 2008. 217(4):343-6. [Medline]. Dimitriou F, Frauchiger AL, Urosevic-Maiwald M, Naegeli MC, Goldinger SM, Barysch M, et al. Sarcoid-like reactions in patients receiving modern melanoma treatment. Melanoma Res. 2018 Jun. 28 (3):230-236. [Medline]. Tchernev G, Lotti T, Wollina U, Cardoso JC, Popova LV, Maximov GK, et al. Sarcoidosis in A. C. Milan (1899)?. Open Access Maced J Med Sci. 2018 Jan 25. 6 (1):99-102. [Medline]. Terziroli Beretta-Piccoli B, Mainetti C, Peeters MA, Laffitte E. Cutaneous Granulomatosis: a Comprehensive Review. Clin Rev Allergy Immunol. 2018 Feb. 54 (1):131-146. [Medline]. Sibaud V. Dermatologic Reactions to Immune Checkpoint Inhibitors : Skin Toxicities and Immunotherapy. Am J Clin Dermatol. 2018 Jun. 19 (3):345-361. [Medline]. Stage III pulmonary disease with pulmonary infiltrates. Disclosure: Serve(d) as a director, officer, partner, employee, advisor, consultant or trustee for: AbbVie; Biogen IDEC; Eli Lilly; Janssen; Momenta<br/>Serve(d) as a speaker or a member of a speakers bureau for: AbbVie; Eli Lilly<br/>Received grant/research funds from Biogen IDEC for investigation; Received honoraria from Amgen for investigation; Received honoraria from Amgen for review panel membership; Received honoraria from Eli Lilly for review panel membership; Received honoraria from Novartis for review panel membership; Received honoraria from Pfizer for investigation. .